Is your dog food KILLING your doggie? It was her last day. The time had come to where she was really suffering. We had to make some decisions, but we are Apostolic. We were believing and trusting God for a miracle. Goldie was our family member and we wouldn’t euthanize any other family members, so why would we do that to her? Besides, what if God was going to answer with our miracle. She had not been able to eat for 8 days. She had to be carried to the yard to do her business, as she was too weak to walk. She had distanced her self for the past week in preparation for an eternal separation. But, today was different and we all knew it. Our family decided to push back the plate until 3pm that Monday as we waited on divine direction. We all gathered in the middle of the living room floor that morning and prayed specifically that God would either heal or take Goldie by 6pm, no wait 7pm…let’s give God an extra hour to work. If neither of the above occurred, then we would take her to the vet and let them put her to rest. This is absolutely the last thing that we wanted to do, because questions would have always lingered in our mind. However, she was pitiful and in pain. There was no treatment that we hadn’t already tried that could help her. At around 2pm, we were all sitting on the back porch. My father-in-law just happened to be there too. This was ironic because he had been on life support and at death’s door the week or so prior. In fact, while I was receiving the news at the vet, my husband was receiving a call from the hospital in Kansas City that they were calling in the family. Goldie typically traveled with us, but Papa would help take care of Goldie when we were out of town and we could not bring her with us. She even went with us to see Papa at the hospital in Kansas City. Thankfully, Papa made it and now here we were on our back porch just visiting. Goldie, with her last bit of strength, she stepped down from the swing and began making her way to each person in our family. She let each person pet her and love on her as if to say good-bye to us individually. She had moved very little in the past 8 days, so this was highly atypical behavior. In silence, we all just took our turns loving on our furry friend. Well, Goldie went back on the swing and Papa went home. At 3pm, our scheduled time for our little fast to end came and then at 3:13 pm, our Goldie passed. It wasn’t the answer we wanted, but at least we didn’t have to take matters into our own hands and her pain finally ended. She was buried with her favorite pink ball and a pack of her favorite candy, Sour Patch, except this time she didn’t just get the green ones, she got the whole box. Yes, she is just a dog. However, to our family, she was the one who chose us over the neighbors in our old neighborhood. She is the one who would not leave my husband’s side when he was injured. She was a sorry excuse for a guard dog, but taught us the true definition of loyalty. She chewed so many plastic water bottles that her teeth were barely nubs. She loved Rudi’s organic bread and there were many a loafs that went missing under her watch. It has been 99 days since our beloved Goldie Girl Szumanski left this earth. Even though we had a dog, I use to be one of those people that would think to myself…it is only a dog, give me a break! However, until you lose a pet that is such a vital part of your family, it is hard to comprehend how much you really do love them. In hindsight, I wish I would have done a few things differently. I put so much effort into what I feed my children, it really shocked me that I just kept giving Goldie that Science Diet dog food the vet recommended 9 years ago. I should have known better. I am convinced that Goldie’s death could have been prevented if I had known then what I know now. As we plan to open our hearts and our home to a new pup, I decided that I am going to be a better dog parent. I spent approximately 19 hours last week on researching dog food. Yes, I know that I’m crazy, but that is nothing new. I was amazed at all that I learned through my research, TRULY AMAZED or should I say SHOCKED. Just like humans, what your dog consumes is vitally important to their health. I feel strongly that feeding your dog the appropriate things could literally add years to their life as well as improve the quality of their life. Even if your dog seems fine on a subpar food, sometimes the damage is being done slowly…literally bowl by bowl. People that know me, know that I am a passionate person….sometimes too passionate for some. However, I feel sort of like a puppy crusader in my new dog food discoveries. If just one family decides to make a change in their dog’s food, then that is worth the 30 minutes this has taken me to write. I kept thinking that my post would need to be about all of the best and worst dog foods out there with specific ingredients that were toxic, but suffice it to say those posts are already on the net. Here is more of a bottom-line approach to my findings, from friend to friend so to speak. Here is one popular website that has some dog food comparisons, but honestly many of the top foods on this list still did not make MY LIST. I found the info on Dog Food Advisor and several other blogs to be more consistent and higher quality. I was looking for the BEST option for our new pup and my definition of best meant ZERO toxins, no cheap fillers, ingredients sourced in the US or New Zealand (those with ingredients sourced from Mexico have been known fight contamination issues), and reasonably priced. I also preferred free-range proteins and organic ingredients. When I had my final choices narrowed down, I then tried to look for reviews from pet owners on Amazon, which is where I weeded out several excellent choices because so many pets had digestive issues with them. I also spoke with owners at two of the local boutique type pet stores that carry the higher quality foods. My final conclusion is that I really feel that feeding your dog RAW food is the absolute best option. You can find so much supporting evidence from veterinarians on this topic. However, it can be very costly. There are several raw companies that earned a 5 star rating, but I will only mention a few. Ones that did not receive a 5 star rating or that cost over $5/lb were eliminated off of my list. Although FreshPet products are readily available in most of the refrigerated section of your local pet store or grocery store, ALL of their foods contain a known toxin called CARRAGEENAN, so I do NOT recommend anyone feed this to their pet. My first choice for raw is a placed called Darwin’s Pet. Many raw food companies have had recalls. This makes sense because it is RAW after all. However, this company is one of the few that has NEVER had a recall. They also are more affordable than most raw food providers averaging about $4.30/lb. To my knowledge, you can only buy from their website at : http://www.darwinspet.com We will not personally use this because we are buying a larger breed dog, but for those where money is no option or with smaller dogs, this may be a feasible option for you. Sadly, there were only a handful of dog foods across all types that contained no toxins. Some of those were very costly freeze-dried options, which were immediately deleted off of my list. Canned food is deemed to be better than dry kibble. However, EVERY canned food contained either GUAR GUM or XANTHAM GUM. So, delete, delete, delete on those. Those are not desirable ingredients. Trying to find a TOXIN FREE dry food was like trying to find a needle in a haystack! I found two that were not sold in the U.S. and you could not purchase online. There are a few that contain ingredients that aren’t toxic, but not necessarily ideal. I finally decided on this food for our pup on the way. 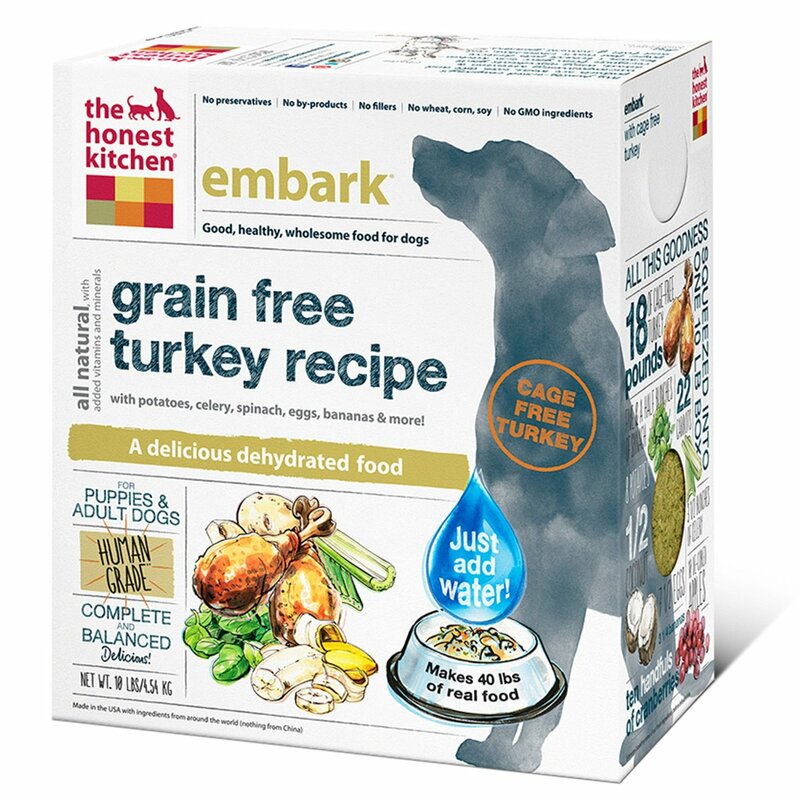 It is by Honest Kitchen and is called Embark Grain Free Turkey Recipe. It is dehydrated and you have to add water, which is better for canines as it is less processed than dry food. This particular food contains NO harmful chemicals or additives. It is pretty reasonably priced when you purchase the 10lb box through Subscribe & Save on Amazon. Keep in mind that 10 pounds will make 40 pounds of food, which brings this option to $1.78 a pound. It also has great reviews, is derived from cage free proteins, contains some omegas, and even includes some organic ingredients. I would be happy to help you determine the quality of what you are currently feeding your dog or maybe help with a recommendation if neither of these works for you. People die and pets die, it is the circle of life. However, it does not have to be because of something we did or did not do. So, the next time you get joy from your furry pal, do them a favor and fill their bowl with nutritious FOOD and not fillers and poison.